Erica Handling, the former EMEA investment bank general counsel (GC) for Barclays, has swapped the bank for a similar role at funds manager BlackRock in a move mirroring the market shift to a more prominent role for asset management companies. Appointed EMEA GC, Handling took up the role on 19 May replacing James DesMarais, who retired in December 2014 after almost six years in the role and ten at BlackRock. Handling will take responsibility for the provision of legal services to BlackRock’s European offices with over 3,000 employees in more than 25 office locations. Managing a team of over 50 lawyers, she will report to BlackRock’s global GC Matthew Mallow and the EMEA Chairman and chief executive David Blumer. DesMarais tenure saw the shift of responsibility to New York for the provision of legal services to BlackRock’s Asia Pacific offices in March 2011. He was also closely involved with international legal and regulatory aspects of BlackRock’s acquisition of Merrill Lynch’s investment management business in 2006 and BlackRock’s acquisition of Barclay’s investment management business in 2009. Handling left Barclays in March following the departures of global GC of corporate and investment banking Judith Shepherd and the global head of financial crime Jonathan Peddie. 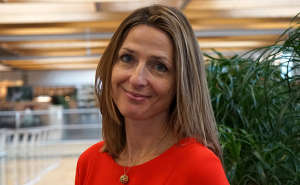 On top of her role as EMEA GC for the investment bank, she was a member of Barclays’ senior leadership group and sat on the group and investment banking legal executive committees. A former Ashurst lawyer, she joined the bank in 2010 following ten years at the firm which included being part of the team to lead the firm’s launch into the US in February 2009. Barclays appointed Simon Croxford, former managing director and GC for Asia Pacific as her replacement, also in March this year.